When I like something, I like something. This is why I have four pairs of the same Lulu leggings, catch early morning sunrises on a daily basis, fill my coffee cup each and every morning, collect headbands, and eat the same food over and over and over again. What can I say, I know what I like. My most current obsession: kiwis. Specifically, Mighties Kiwi. I’ve always loved this little green fruit, but I just discovered all of the nutritional benefits. They are the perfect pre-workout, post-workout, anytime snack. And, they always come ripe and ready to eat. Let’s just say my love has grown. If you remember anything about this, remember these two words: super-nutritious super-fruit. Mighties Kiwi have more potassium than a banana. 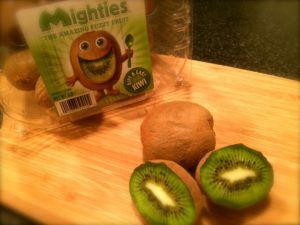 Mighties Kiwi have more Vitamin C than an orange. Mighties Kiwi are rich in free radical fighting antioxidants. Mighties Kiwi have more vitamins E & K than an avocado. Mighties Kiwi are an excellent source of fiber. You can learn more about Mighties here. Now that we are in agreement that kiwis are nutritious and delicious, let’s talk about their simplicity. If you have been following along, you know I do not strive to be Suzy Homemaker or Martha Stewart and my cooking skills, well they are pretty much non – existent. That’s why kiwi works for me. I can CUT. SCOOP. EAT and make some pretty amazing looking foodie dishes, drinks and snacks. But, I won’t just self-proclaim amazing, I’ll show you the amazing here and you can be the judge. 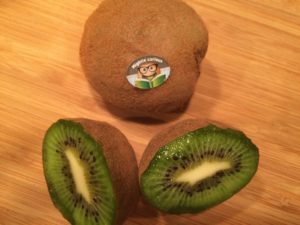 Join the Be Mightie Kiwi Challenge via MyFitnessPal App. This is the best challenge you will probably enter. What do you have to do? Eat kiwis! The challenge will be available as of November 28th. Join for your chance to eat kiwi and win! Sweat. [Be active every day this holiday season!] + CUT. SCOOP. EAT. [Balance the indulgences!]. I bet I may have just created a new obsession for some of you too. Happy holidays – here’s to balancing those indulgences with super foods. I am happy to collaborate with Mighties Kiwi to learn and share the nutritional insight of this fuzzy, green super fruit. While this is a sponsored post, the thoughts and content are genuine.